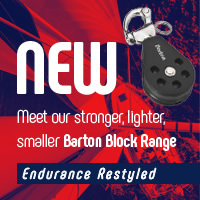 This system makes reefing your mainsail a quick and easy operation. 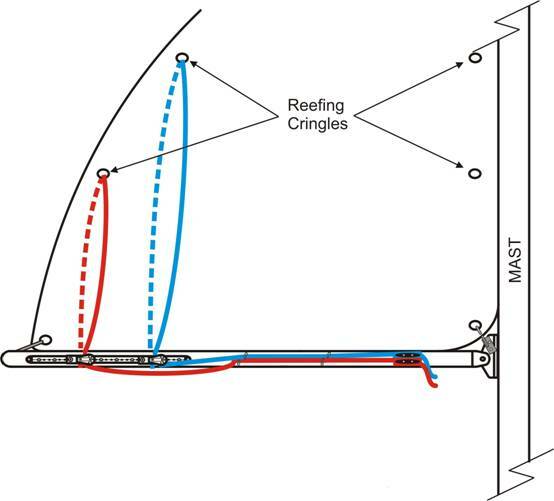 Just lower the mainsail just below a pre-determined mark on the halyard, attach the reefed clew of the sail onto the reefing hooks (not supplied) at the mast end of the boom and tension the reefing line in and secure. 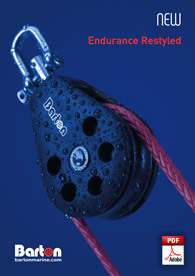 Re-tension the main halyard. We recommend taping all items in place first before drilling any holes and the line to ensure friction is kept to a minimum. The forward end of the track should line up with the position of the secured reefing eye on the sail (highest up the sail, second reef). 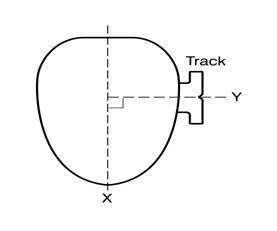 Ensure the track is at 90° (Y) to the centre line of the boom (X). Position the track and mark first fixing location. Remove track, drill using 4mm drill and tap using M5 tap then secure in position using M5 machine screw. Centre punch second fixing hole, loosen screw of first fixing, allow track to pivot away then drill and tap for second fixing. Repeat this procedure until all fixings can be installed. 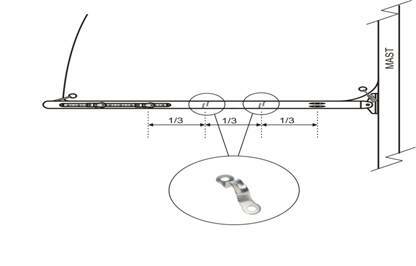 After securing, the screws can be removed and the surplus length inside the boom cut off, to prevent possible snagging of internal control lines on the sharp ends of the screws. Always use a barrier cream between the stainless steel fixing and the aluminium to prevent corrosion. Position the sliders on the track ensuring the plunger end of the slide is aft and the becket on this slide is facing down (this may need to be adjusted depending on whether it is fitted on port or starboard side of the boom. The eye will rotate but may require the use of pliers to carry out this operation). The position of the sliders on the track can be adjusted during a sail trial. The two plastic end caps can now be fitted, ensuring they locate over the end on the track. (This is a push fit) use the centre punch to mark position then remove before drilling and tapping as previously stated. 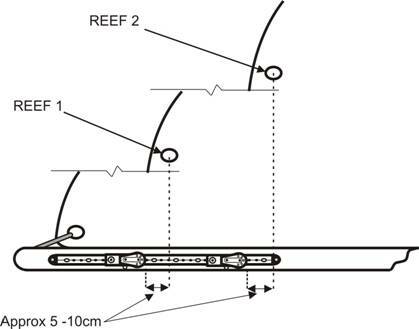 We would recommend fitting several eyes between the slider and where the reefing line is secure, at approx 1/3 intervals. 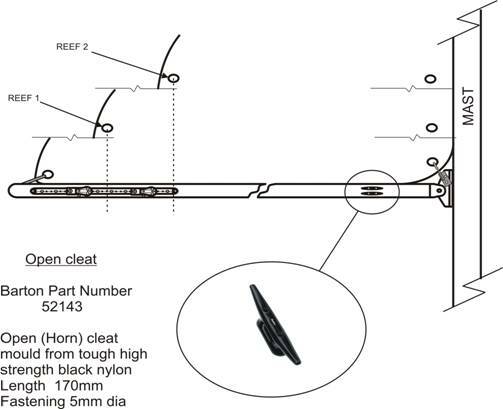 This will stop the line from sagging, restricting headroom etc, when the slab reefing kit is not being used. 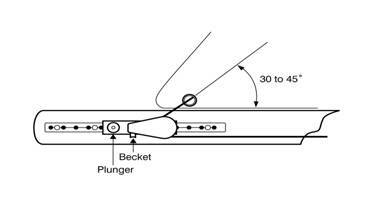 The line starts by being tied or spliced to the becket on the bottom of the slide, under the boom up through the eye, down through the sheave on the slide, then forward along the boom through the eyelets and to the Horn Cleat. 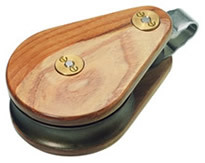 The position of the slider can to altered by lifting the plunger and relocating the slider. 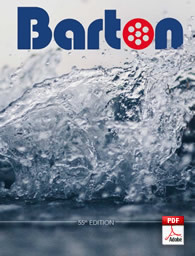 It should be positioned so the line leaving the eye in the sail pulls down and aft between 30° and 45°. 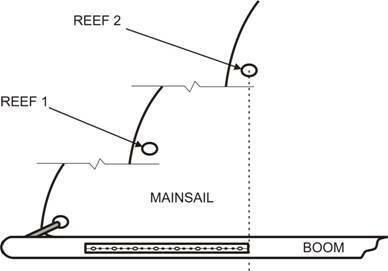 Lower the main Halyard to the correct position for reefing, mark the Halyard at the position of the cleat with permanent marker (reef position 1 +2). 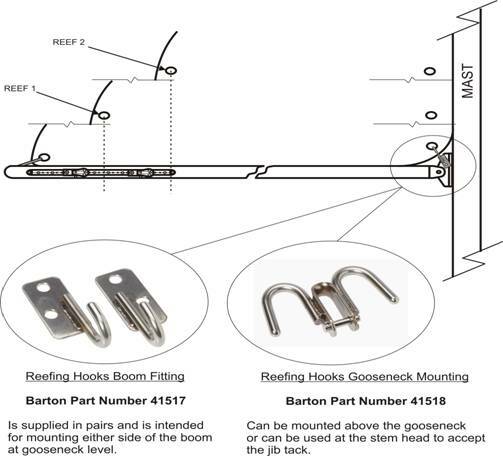 Set the Topping Lift, which ensures the boom does not fall accidentally (by using the Barton Boomstrut together with the slab reefing system, this would eliminate the need for a Topping Lift). 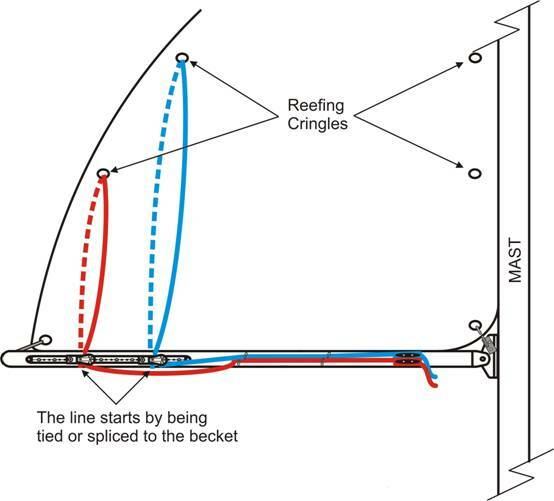 Ease the Halyard to just below the marked “Reef” position, pull in the reef line and secure, attach the tack reefing cringle to the reefing hook, then tension the Halyard. The sail is now reefed.